Guitar World recently spoke with Glenn Hughes about the new Black Country Communion LP, his upcoming tour honoring the music of Deep Purple, gear and more. Joe Bonamassa has just released an official music video for his song "Dislocated Boy." Watch it below. Prolific rock supergroup Black Country Communion have just released a brand new track from their upcoming third studio album, Afterglow. You can stream "Confessor" below. New Black Country Communion Album to Be the Band's Last? 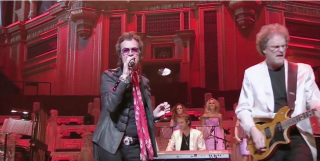 According to a recent Tweet by bassist Glenn Hughes, Black Country Communion are entering the studio this weekend to record their third studio album. Guitarist Joe Bonamassa will release a new live DVD -- Joe Bonamassa: Beacon Theatre – Live From New York -- on March 26. Guitar World was on hand when Joe Bonamassa and Seymour Duncan unveiled their new limited-edition Joe Bonamassa pickups at last week's 2012 Winter NAMM show in Anaheim. Right after Joe Bonamassa and Seymour Duncan unveiled the the new Bonamassa signature pickups, they jammed on two blues tunes at the Seymour Duncan booth.